And here we back to stage again, is kinda tired to walk around to catch up all the happening since all the activities is quite pack, feel thirsty all the time and it was scorching hot, but it didn’t deter me from sweating under the hot sun and shoot countless photos as the race queens on the stage. When you see the lovely Japanese Race Queens you will forgot about hungry, tired, thirsty and toilet. Anyway, since you are here and you didn’t get to meet them, let me show you my photos again. 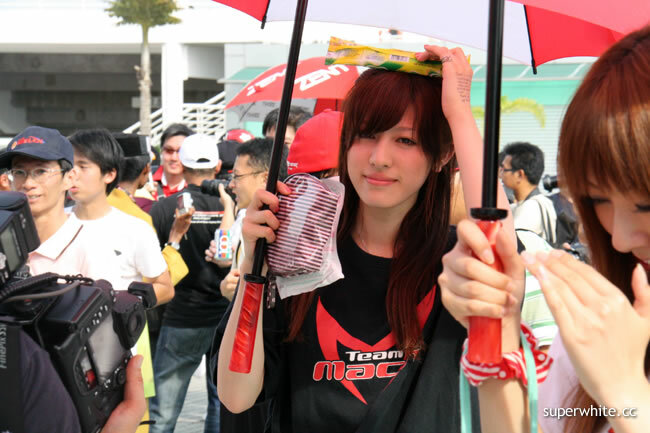 Back to stage again and Raybrig Race Queen (Mai) is giving away the free t-shirt… I think. The show running by Landslide of Dragon Red. See the white paper she holding? Yes.. S Road Girl (Saki) is having introduction of herself and the Super GT Team they support. Weds Sport Race Queen (Mika), stripe open side. Ishimatsu Queen’s Tokyo Girls (Marie & Sanko), hmmm…. maybe is for guai lou taste. Oh yes, that’s Nana and Sana again, they are the legendary race queens for Super GT! They are cute and… kawaii, even Landslide also make joke Sana that they going to marriage this year. Performance by them, they are quite good dancing! Nana… I love you too. Below the stage, yea… all people huddled, so just point and shoot aimlessly! When Eneos Girls (Megumi & Yukie) came out, Se-la-mate, pa-gi…… with japanese slang but during that time is already afternoon. Vantelin Race Queens & Matsumoto Kiyoshi Race Queens (Chisaki & Ayumi). MOTUL Circuit Lady & AUTECH Race Queens (Ume & Yuki), Ume on the left have a beautiful smile and she can speech english very well. Behind the stage where after the race queens finish their presentation and walking to their ROOM. All the hungry photographers follow them everywhere they go. Hiromi Kawai with the hot assistant. I like this girl from Mach Shaken Gals – Mana Mizuno. She look cute and she holding the little pinkie bag. ZENT Sweeties girls Chika Tono walking back after the mama sang buy drinks for them as a reward. Junko Iida shock her self while she walking with her umbrella, no idea what was that but always with the cute pose no matter what reaction they have, very professional. I Love this costume, especially the Collars.